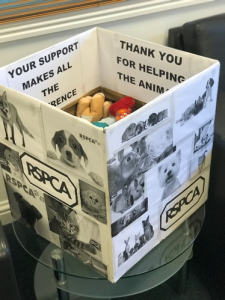 We had a meeting today, our directors had been speaking to the staff at the RSPCA Animal home in Stretton and decided that it was a good idea to start taking collections for the RSPCA. I am so proud and excited to be able to help out the RSPCA! I am a big animal lover and this is a charity close to my heart and the ONLY charity, apart from the PDSA, that I will donate to. There are many good organisations and worthy causes for people to donate but for me, the RSPCA is one of the only charities that you physically see where your donations go! After speaking to the staff at the RSPCA Animal home in Stretton I learned that the heating in the kennels had recently been on the brink and they were desperately trying to raise money to fix it. At this time of year, with the temperatures we’ve been experiencing, I can’t help but feel for those poor cats and dogs freezing their paws off! I had the job of decorating the collection box which would go in our reception (which was actually really fun). We placed it in plain view so anyone wondering in would see it. We hope to receive lots of donations for the RSPCA in Burton to sell in their shop in Burton (on the High Street). The money raised will help them pay for veterinary care, support their food fund and pay for beds and cover the many many costs associated with looking after these vulnerable animals. I felt like I had done my bit in decorating the collection box but I also had a whip round at home to find items I could donate to the collection box. However, most of the things I could find, I had already bought from their shop on the high street. Confession time! It’s no secret that I absolutely love their shop, there are soooo many nice things I find there all the time. I never leave without buying at least 2 things! Anyway, we’d really really love for you to donate! (N.B. Donate anything you would give to a regular charity shop!) Soft furnishings, old-but-still-good cloths, toys, pet beds, anything they can sell to raise money. You will be helping animals stay warm, fed and happy this winter.